My first full-length devotional, Waiting for God: Trusting Daily in God’s Plan and Pace, is available for Pre-Order on Amazon! To God be the glory, the honor, and the praise, praise, praise! I used to be toe-tapping impatient when standing in lines. I would get irritated when I made a phone call and was left on hold. My inability to embrace the act of waiting when juggling life’s small frustrations became more evident when I faced heart-wrenching delays. Waiting was not a welcome part of my life, especially when the wait was accompanied by physical or emotional pain. When I first surrendered my life to Jesus, a friend warned me not to pray for patience. So what was I supposed to do? How was I going to deal with the inevitable waiting seasons in life if I couldn’t be honest and ask God for help? After my battle with chronic pain became overwhelming, I longed for comfort, for peace, for revitalized strength and realized patience has nothing to do with trusting God in the wait. Patience requires us to suppress rather than process feelings and is reliant on our ability to control our actions and attitudes in our own strength. Over the years, I’ve learned the futility of self-help and will-power. So, instead of trying harder, I admitted my weaknesses. Sick of being burdened by anxious thoughts and tired of feeling stuck, I cried out to God. With Spirit-empowered strength, I looked for Bible verses to help me trust the Lord when the wait felt endless. I reflected on how other faith-warriors leaned on God while facing difficult situations. My search for enduring hope revealed unexpected answers. I didn’t need more patience. I needed a new perspective on the Maker of Time’s purpose of waiting. As I inhaled God’s Word, I exhaled in prayer and experienced the power of resting in God’s love. Now, I have the privilege of sharing my journey with you. 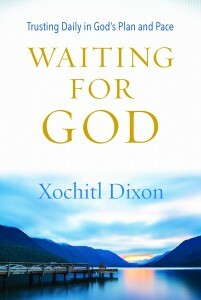 What others are saying about Waiting for God? “If your heart is weary and longing for answers—for healing, for provision, for miracles—Waiting for God renews your hope with strong biblical truth and encouraging Scripture-based prayer. Conquer your fears and frustrations as you inhale God’s Word, exhale in prayer, and rest in God’s love. Live a life of deeper connection and immediate communion with God that can lead to contentment in His constant presence, no matter what your days hold or how long God’s deliberate delays may last. 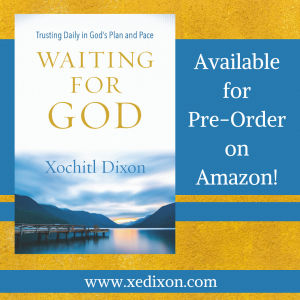 Waiting for God: Trusting Daily in God’s Plan and Pace is available for pre-order on Amazon and scheduled for release on August 7, 2019. I’m looking for readers willing to join me for this pre-order party and to prayerfully consider reading through one chapter a day with me after the book is released. I’ll be offering exclusive giveaways to readers who join the conversation as we discuss the end-of-chapter reflection questions, which are designed for personal and group study. Please take a moment to follow my Amazon Author Page and pre-order your copy of Waiting for God: Trusting Daily in God’s Plan and Pace. Please also leave a comment below to share how I can pray with you as you continue waiting for God and trusting daily in His plan and pace . . . one breath at a time. I look forward to growing with you! As a teenage runaway, I convinced myself that survival made it necessary to place my needs above everyone else’s. I demanded my way, dug in my heels until I proved myself right, and prided myself in being independent. I gave to no one. I insisted I needed no one. I submitted to no one. After repeatedly falling face-first in the mess caused by my foolishness and self-centered sinfulness, I met a King‒Jesus‒who proved Himself trustworthy. Prayerfully reading through the Bible yearly helped me learn more about God’s character as I discovered how much my personal Lord and Savior loved me, how much He gave for me, how much He promises me. I began to realize He was and is and always will be the only One worth following. Falling in love with Jesus changed my perspective on servanthood. But how could I learn to follow Christ when every fiber in my being still struggled with stubbornness at times? How could I possibly hear His direction when a war waged between my self-serving heart and my desire to have a surrendered servant’s heart? Though the concept of surrender filled me with fear, the Lord used a humble servant in Genesis 24 to help me learn to S.P.R.A.W.L. before my trustworthy Master, Jesus Christ. When Abraham sent his servant to seek out a wife for Isaac, the servant fretted over his ability to complete the task (Genesis 24:1-9). Abraham assured him that he Lord would be with him and equipped with all he needed for his travels (vv. 10-11). Scripture doesn’t tell us how much time passed when the servant arrived in Nahor, but we do know how he spent his time. He stopped and prayed (vv. 12-14). He released his worries into God’s able hands. Through his honest and confident prayer, the servant opened his heart to the peace of trusting God with the outcome (vv. 15-21). He watched with expectancy as he waited for God’s answer (v. 33). And even when others tried to distract him from his purpose and delay him, the servant listened‒obeyed his master‒followed the Lord and started on his journey home (vv. 34-61). This nameless servant chose to S.P.R.A.W.L. before the Lord when given a seemingly impossible task and became a vital part of God’s plan in bringing Isaac and Rebekah together (vv. 62-67). The Lord never leaves us empty-handed when He calls us to follow Him. 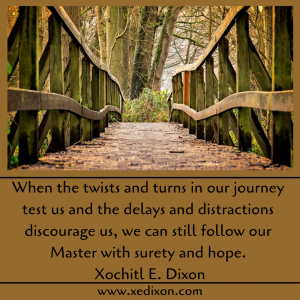 When the twists and turns in our journey test us and the delays and distractions discourage us, we can still follow our Master with surety and hope. As we S.P.R.A.W.L. like a servant before the Lord Almighty, He can use us to make an eternal impact in someone else’s life. Lord Almighty, thanks for affirming Your unending love for us as You empower us to S.P.R.A.W.L. before You whenever we face challenges. Give us wisdom to stop when we need guidance, pray with confidence, and release our worries into Your capable hands. Help us acknowledge You as our Holy God full of goodness and mercy, as we watch You place every piece of Your plan in place. Help us listen to You‒to hear You and obey You as we follow You. How did your life change when you chose to live with a servant’s heart instead of a self-serving heart? Is it harder for you to stop, pray, release, acknowledge, watch, or listen to God? I grieved when I remembered the various apologies and fear-filled prayer requests. I’m so sorry to bother you with this prayer request. I know others are worse off than I am, but do you think God will help me? Is it okay to ask God for help when so many others are hurting around me? Is my request too small, too personal, too self-centered to bring to God? How many precious children of God fear or avoid asking for intercessory prayer because they feel their needs are not as important as someone else’s? How many beloved brothers and sisters in Christ keep quiet, ashamed of wanting to ask for their needs to be met because their neighbors’ problems seem bigger, more severe? God cares about every single detail of our lives. Our compassionate Creator wants us to come to Him, whether we’re suffering from illness, trudging through seasons of grief, or battling discouragement, fear, insecurities, or doubt. How often have I been afraid to be accused of whining before God’s throne of grace instead of being confident in God’s amazing grace? What would it take for me to be assured of God’s limitless love, perfect faithfulness, and immeasurable mercy? Would the Lord care if I’m weary when someone else is fighting for their lives? Would He care if I’m discouraged when someone’s family is falling apart? Would God care if I need courage to work towards a dream when someone’s struggling to make ends meet? The Lord doesn’t minimize or neglect any of His children. He doesn’t compare us to one another, because He knows He created us as unique individuals. He orchestrated every twist and turn, every mountain-top moment and every step through the dry and lush valleys. 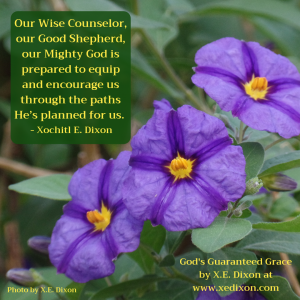 Our Wise Counselor, our Good Shepherd, our Mighty God is prepared to equip and encourage us through the paths He’s planned for us. He uses His unchanging Word to arm us with courageous and persevering faith. God changes us as He challenges us when we walk with Him daily. He purifies our hearts and minds and motives, aligning our thoughts and adjusting our longings until we mirror Him, by the power of His beautiful grace. We can’t trick our Father, pretending we’re mature just because we’re good at looking polished and presentable. He knows when we’re broken, when we can barely breathe. He knows about our sins, our selfish thoughts, our self-centered jealousy. He knows about our wants, even when we’re afraid to admit them. He knows about our struggles, even when we’re drowning in denial. He knows about our joys and our pains, our hopes, our dreams, and our greatest fears. Because Jesus is the great High Priest, who has ascended into heaven, we can hold unswervingly–without fear, without hesitation, without a single doubt–to the hope we profess (v. 14). Our mighty Lord understands everything we’re going through, as He showers us with compassion and magnifies His loving perfection and limitless power in the midst of our weaknesses (v. 15). With these truths anchoring our faith to His promises, we can trust Him, surrender to Him, walk with Him, and embrace the freedom of His forgiveness when we repent and turn away from our sins. When we need rescue, relief, or rest, God cares. When we need encouragement, God cares. When we need a miracle, God cares. In our personal time of need, God cares enough to promise us that He’s approachable and abundant in grace. God’s plentiful love for us gives us the confidence we need to come before Him with our needs, to pray for others and for ourselves as an act of worship and a brave display of our trust in our Savior. Thanks for assuring us that You are our Great Physician, our generous Provider, our gallant and good Shepherd, our Almighty King. Thanks for never comparing our circumstances to the circumstances of others, Lord, for never minimizing our feelings, for never belittling us for struggling. Thanks for reminding us that You care equally about every little detail of our day-to-day living and every overwhelming burden that weighs heavy on our minds. Good Father, please give us courage to come to You for all things. Help us know You’re not randomly picking or choosing one concern over another. Empower us to trust Your timing and Your plans are perfect in every way. Please help us rely on Your ability to love without limits, to extend immeasurable grace without running low, and to be fully present and caring with each of us without neglecting any of us. Thank You, Lord Almighty, for the privilege of loving You as we learn to accept the unconditional life-changing love You have for each of us. Have you ever been hesitant to bring your prayers to God when you compare your requests with the requests of others? How does knowing God never compares us with others increase your gratitude for His loving care, your courage in prayer, and your depth of faith? I thank the Lord for each and every one of the amazing members of my blog family. Yes, that means you! Thanks for subscribing to my blog, for showering me with God’s love wrapped in kind words of encouragement, and for joining me as we dig deeper into His Word and draw closer to His heart. Thanks for being radiant lights for Christ in my life and for allowing me to encourage you by sharing what the Lord teaches me in my day-to-day walk with Him. Today was a great day, as I rejoiced in another unexpected and exciting ministry opportunity. God is working on the details. I can hardly wait to share more as He reveals His perfect will in His perfect timing during this day-by-day adventure. 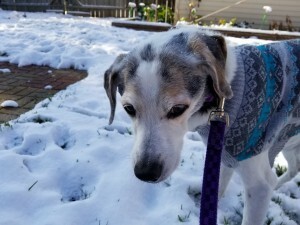 Today was also a rough day, as I struggled with pain management and the frustration of caring for our 15-year-old senior dog battling arthritis and losing her “housetrained” status. Isn’t the Lord so wonderful, as He gently reminds us that each day is filled with reasons to worship Him, surrender to Him, and rely on Him? He gives us countless opportunities to trust Him and welcomes us to cry out to Him in prayer and praise Him with reckless abandon. What a blessing it is to know that God is keenly aware of our weaknesses. He understands when we get frustrated. God . . . gets . . . us. Our patient Lord isn’t surprised or disappointed when we fall short or fall flat on our faces. Our loving Father simply remains constant and true to His Word, fully prepared to wrap us in mercy as He loves us unconditionally. Our Almighty Maker and Sustainer refreshes our spirits and strengthens us with compassion that exceeds all expectations. Our Good Shepherd extends grace freely and consistently, waiting for us to realize we can count on Him time and time again. Our faithful Redeemer and Restorer gave me so many reasons to shout praises of joy today. So, why did I focus on shaming myself every time I got upset because I was stumbling again, struggling again, and failing again? As I grumbled my way through another fumble, after losing my cool when my faithful old dog made life a bit more inconvenient, I prayed. That’s when I realized the time had slipped away from me. I was late in choosing the winners of the books I was scheduled to give away on my blog. Just as I started with the self-inflicted forehead-slapping guilt trips, our gracious and generous Father overwhelmed me with His all-encompassing grace and a healthy serving of gratitude. I thanked Him, in awe of how His love flowed through your beautiful souls as I read your comments. 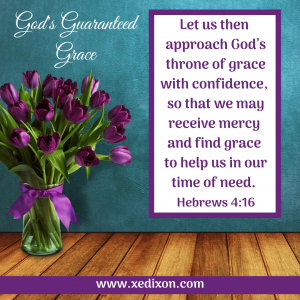 God’s grace was more than sufficient . . . again. His power was made perfect in my weaknesses . . . again. And His perfect peace, His eternal hope, and His endless joy prevailed . . . again and again and again. I’m excited to see what the Lord has in store for us as we continue nurturing our relationships with Him and others. The responses to this post blessed my heart beyond measure. So, I decided to give away an extra copy of God Hears Her with that sweet swag. I am pleased to announce our three winners and am already looking forward to planning another book giveaway. Today’s winners are Judy Picton, Jana Engelmann, and Patricia Kohn. Please email your complete mailing addresses to Xochi@xedixon.com at your earliest convenience. Thanks again for all of your support and encouragement. I hope you’ll return to join me in praising our Almighty Lord and Savior, as we seek Him in His Holy Word and rest in the peace of His constant presence. Thanks again for all of your support and encouragement. It is my pleasure and privilege to serve You as we grow in love for Him and others. Lord, we’re so grateful for Your everlasting love. Thanks for affirming that You hear our heart cries, even before we can manage to whimper or utter an incoherent word. Thanks for assuring us that You’re already ahead of the game, already prepared for the unexpected twists and turns that will often punch us in the gut and bring us to our knees. Thanks for confirming You are delighting us, rejoicing with us, and working in and through us, sweet Savior. Make our praise genuine and infectious as You make Your name glorious! You can purchase more copies of God Hears Her on the Discovery House Publishers website. This beautiful Our Daily Bread 365-Day Devotional includes devotions written by my fellow ODBM sisters in Christ. I’m grateful that eleven of my devotions are included in this book, which is the perfect size for a stocking stuffer and a lovely just-because gift. Thanks for supporting Our Daily Bread Ministries. During the last three months of blogging-silence, life has been anything but quiet. My husband and I followed God from California to Wisconsin . . . yep . . . Wisconsin. As native Californians, we should have been freaking out when Alan received the job offer in July. But we’d been praying for years, waiting for God to show us the next step He wanted us to take after Alan graduated. We anticipated a move, but never imagined the Lord would provide my husband with a job he never applied for . . . at a university we’d never heard of . . . in a little midwestern town we never knew existed. Well, God did all of those things. Filled with an unexplainable peace, we packed with the help of our two grown sons and said goodbye to friends and family in less than a month. 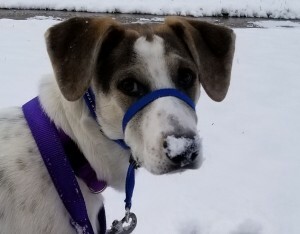 The Lord provided a home with a fenced yard, an oh-so-rare amenity in our area but perfect for our senior dog, Jazzy (pictured here), and the new pup we adopted the day after I arrived in Wisconsin, Callie (see photo below). We waited for blessings upon blessings to flow after such a big step of obedience. A few days after our move-in date, nine tornados touched down in our new small-town. For the first two months of our Wisconsin life, the Lord gave us plenty of opportunities to get used to midwestern thunderstorms. While He spared our home from flooding (Thank You, Lord! ), a few of our neighbors didn’t fare so well. The torrential rains transformed the creek next to our yard into a river and, for the first few months of our residency, Wisconsin experienced the worst infestation of mosquitos in over a decade. During this life-altering adventure, my chronic pain has been constant and often difficult to manage. My husband is still recovering from his back surgery, so his pain levels often cause complications. We’re still living in totes and, after our first snow-day on Thursday, realizing California-Winter clothes are not Wisconsin-Winter clothes. This move has challenged us physically, emotionally, mentally, and even spiritually. But every time frustration bubbles up, every time we begin to wonder if we heard the Lord’s direction correctly, He reminds us He’s moving in the wait. The Lord blessed us with Wisconsin friends who welcomed us before we even stepped over the threshold of our new home. My husband loves his new job and his colleagues. I’m grateful for the great team of doctors who are working to help me begin to manage my pain again. We can’t thank God enough for our fabulous veterinarian, who happens to be an Our Daily Bread reader with a staff that loves both of our doggy-daughters. So, we’re at peace as we adjust to Wisconsin Life. We’re waiting expectantly for the Lord’s purpose to prevail as He works in and through our new experiences and helps me finish my book. Waiting for God: Trusting Daily in God’s Plan and Pace will be published by Discovery House Publishers in the fall of 2019. To God be the glory, the honor, and the praise . . . praise . . . praise! Though we’ve faced many obstacles, our heavenly Father has been faithful and good through every moment of our transition. As we face changes or delays in life, we’ll encounter tough times. We’ll grow weary, grieve great losses, suffer from afflictions, and maybe even battle bitterness in the wait. But we can count on God to be with us and for us . . . no matter what’s behind us or ahead of us. In Lamentations, traditionally ascribed to the prophet Jeremiah, the writer admits his bitterness over past afflictions, confesses his wandering ways and recalls his disheartenment, but calls to mind the countless reasons for his hope (Lamentations 3:19-20). Whether we’re moving into new territories or stuck at a stand-still during the seemingly endless waiting seasons in life, God’s love will strengthen our resolve. “The LORD is good to those whose hope is in Him, to the one who seeks Him; it is good to wait quietly for the salvation of the LORD” (vv. 25-26). God’s loving care isn’t dependent on our feelings of worthiness or our check-list of good deeds. He remains faithful because He is God in all His perfection and goodness. When we’re right smack-dab in the middle of a waiting season battling trials left and right, we may begin to question ourselves. Did we hear God correctly? We may feel misguided or cast aside, but we can be sure that we are far from forgotten. “For no one is cast off by the Lord forever. Though He brings grief, He will show compassion, so great is His unfailing love. For He does not willingly bring affliction or grief to anyone” (vv. 31-33). We don’t need to fear change or hesitate when God calls us to move toward the unknown. Our loving Master goes before us, remains with us, and stays true to His word. Lord, thanks for assuring us that You will never lead us in the wrong direction. Give us wisdom and discernment as we seek You and courageous faith as we follow You. In Jesus’s name, Amen. Why is it tempting to fear change or hesitate when God calls you to move toward the unknown? In what situation did the Lord seem silent, but later proved to be moving in the wait? 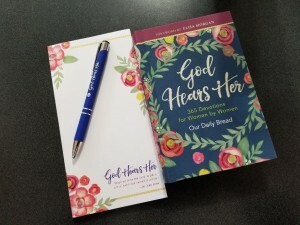 As I prepare for the Fall 2019 release of Waiting for God, I’m giving away a copy of God Hears Her, an Our Daily Bread 365-day devotional that includes eleven of my devotions. 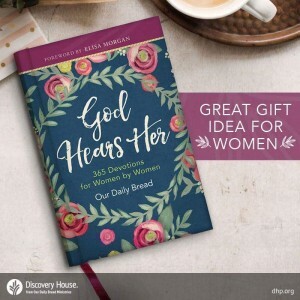 You can purchase copies of God Hears Her, along with some sweet swag, on the Discovery House Publishers website today! This year has been as memorable and filled with answered prayers as it has been quick in passing. For the last few months, God’s been doing a bit of refining work in the lives of my family members. We’re all dealing with different challenges but, by the Lord’s insurmountable grace, not one of those situations has knocked us out or kept us down. Hallelujah! The trials have brought us closer to God and one another in ways I never dreamed possible. Perfectly? Not a chance. Personalities don’t always mesh well within families. Hopeful? Absolutely. God’s note even close to being done refining us through these fires. When we come up against seemingly endless journeys filled with impossible obstacles, it’s often tempting to misunderstand the purpose of the wait. Though it’s not always easy, God can clear our perspective about the reasons we can hope with bold confidence. God gives us the power to recognize the benefits of His planned seasons of stillness, the goodness behind His deliberate pauses, the immeasurable and life-transforming reach of His mercy in the meantime. 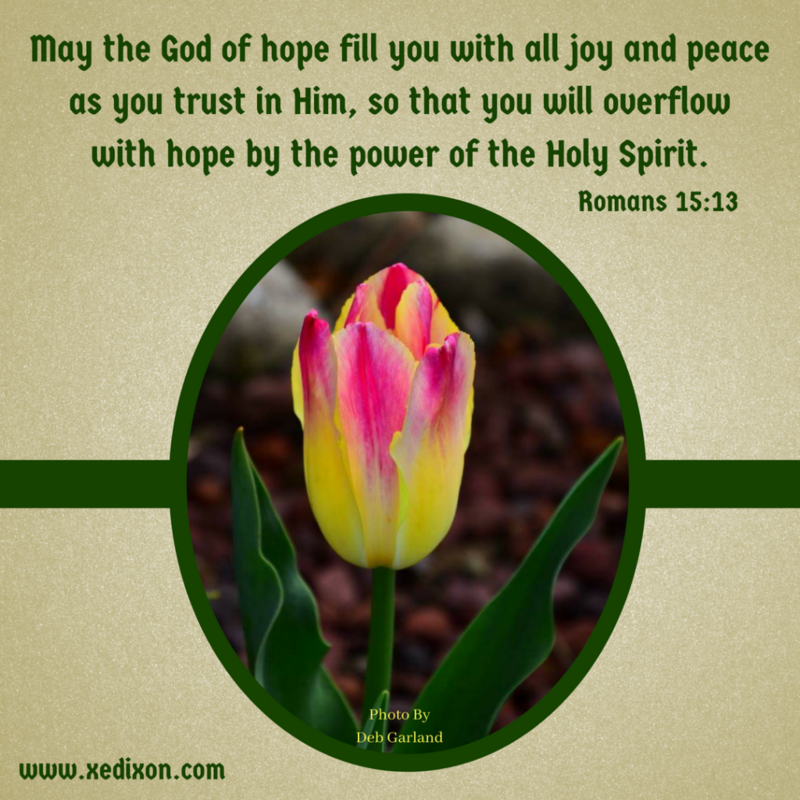 The apostle Paul shows us how to overflow with hope, God’s hope, by first accepting that hope is not a momentary or stationary state of mind. Hope is living and breathing faith that assures us that God’s promises will continue flowing, when needed, as needed, and even before we know we have a need. We serve the God of hope, the One who bases the guarantee of His promises on His unchanging character. The Lord Himself fills us with all joy and peace . . . all . . . as we trust Him. All. As. Such simple words jampacked with the implication of perseverance, continual shows of Spirit-empowered courage and strength. Why does He do this? Why does the Lord choose to fill us, to energize us, to empower us . . . to hope with expectation that’s solid and strong? So that . . . we may overflow with hope that covers every trial, hope that runs in and through every one of our relationships, hope that changes our vision and revitalizes the weariest of spirits. We can praise God in the meantime and trust He is always working in and through the moments we wish would zip by faster. But in His perfect love, He stills our jittery hearts and reminds us that He’s got great plans for us in the wait. How do we overflow with hope in the meantime? Stick close to the trustworthy King of kings, seeking Him, surrendering to Him, and being dependent on Him. Hope anchored in the Sovereign Lord keeps our praises bursting through the atmosphere of despair, fear, anxiety, discouragement, and insecurity. Because of God’s ongoing consistency, we can face changes and persevere with great expectations through every moment of His ordained waiting. Lord, thanks for helping us walk with steps solid in contentment and confidence in Your perfect love and all-around goodness. Please help us remember that trust is a verb that tugs us onto the rocky-edges of mountaintop faith. As You secure our footing in Your infallible truth, we can turn to You and count on Your love to carry us, change us, and cover us in Your healing mercy. Please help us breathe in Your everlasting hope and exhale with grateful hearts as we share Your hope with others. In Jesus’s name, Amen. 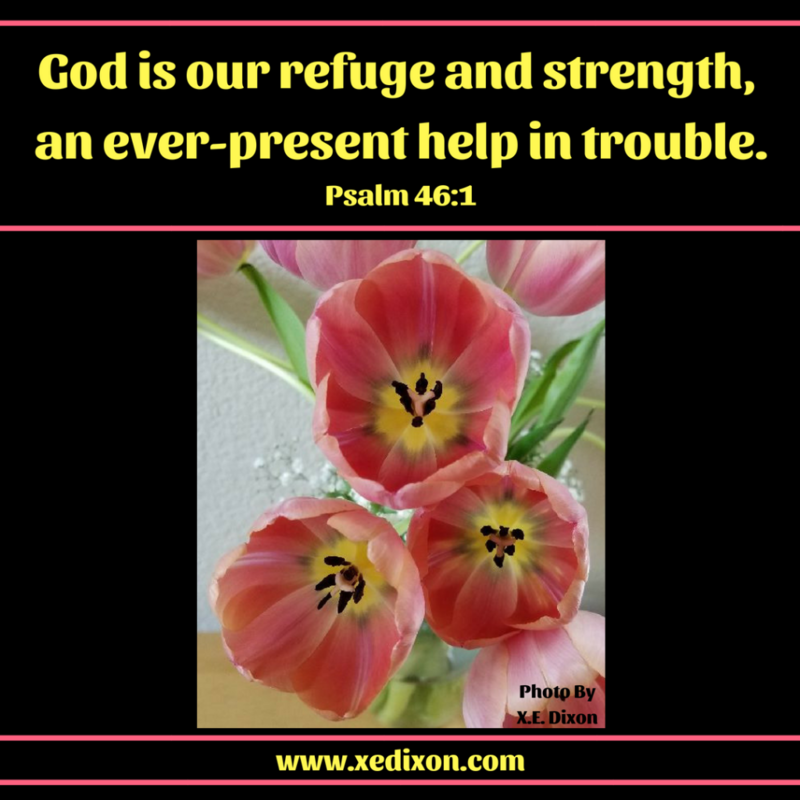 Special thanks to Deb Garland for blessing me with the privilege of using her photo to create this week’s encouragement meme. Does God Want Us to Be Weak? Some questions make us feel uncomfortable. Some questions uncover deep wounds, fears, insecurities, and dashed hopes. Some can’t be answered on this side of eternity. Browsing through the book of Psalms affirms God understands our need to wrestle with questions, process our emotions, and feel understood and confirmed. Earlier this week, a reader sent me an encouraging note about a devotion I’d written for Our Daily Bread. After dealing with decades of pain, this reader struggled with the concept of God allowing Paul to live with a “thorn” (1 Corinthians 1:20-31). Sorrow filled me as I considered the weariness that led to this beloved reader thinking any life God created would be considered common‒ordinary, unexceptional, mediocre. Anyone who has dealt with day after day of chronic pain knows perseverance is a gift from God, an extravagant display of faith and breath-by-breath trust in the Lord. When we can’t take the simple things in life for granted, we may forget the true definition of weakness is lack of strength. Anyone who has endured decades of pain may feel weary, but they are certainly not weak . . . even when we struggle to take each step. Hallelujah! Another human . . . just like me. Who wouldn’t feel more peaceful and content without pain and the anxious thoughts that tag-along with any type of affliction? I wanted to shout, “Me, too!” But the reader’s next question tugged me into a wrestling match with truth. Oh, how a part of me wished I could give this reader a cheerful answer, holding my chin out and declaring with surety that the Lord wants us to feel strong, assured, peace-filled and worry-free all on our own. That moment of insanity passed quickly. Does God want us to feel weak and impotent (powerless, helpless, unable, and incapable)? Does God want us to feel emasculated (ineffectual, feeble, unimpressive, and incompetent)? I could give useless personal opinions or go straight for the infallible truth-source‒the Bible. When I struggle with weakness and weariness, I think about the apostle Paul. He lived a “common life” fully aware that his strength came from Christ. In my experience, there are no “great men and women of faith” who are not fully aware of their complete dependence on God. The apostle rejoiced in God’s grandness by accepting the reality of his own lowliness‒meekness, commonness, and humbleness that led to willing submissiveness. God’s power. God’s strength. God’s wisdom. If the Lord wants us to be weak, why would He offer to be our strength? Why would He affirm that His “grace is sufficient” for us; His power “is made perfect in weakness” (2 Corinthians 2:9). God knows we’re weak (Psalm 103:13-14). He knows we can do nothing without Him (John 15:5). God knows because He chose to experience the feebleness of our fleshly existence (Colossians 1:15-20), without giving up His divinity (Hebrews 4:14-15). God knows we’re weak, so He invites us to abide in Him, rely on Him, and submit to Him. He wants to give us all we need to stand strong, rooted in His unchanging truth and love. Like the brave reader who couldn’t see the great courage and strength the Lord gave him to reach out with such vulnerability, I’ve succumbed to the weariness and worry that accompanies just about any waiting season. Today, my physical pain has been constant and overwhelming. I’ve been trying to write this article for days, but my body and mind are tired and beat down. Praying and knowing I’m covered in prayer, I’m finally typing this sentence with eyes half-closed and heart wide-open. In God’s enduring love and sufficient grace, He is our peace, our faithful power source. When our “hearts are set on pilgrimage,” we remember this side of eternity is not our final destination. He doesn’t want us to be weak. Our all-knowing, all-powerful, all-good, and all-faithful God wants us to let Him be our strength. Lord, please help us stop believing the lie that You will never give us more than we can handle, so we can start living in the confidence that You‒our Creator and Sustainer‒will always be our strength. In Jesus’s name, Amen. On Mother’s Day, some of us will enjoy quality time with our mothers. Some won’t have that privilege. Others won’t even want to speak to their mothers. People will be rejoicing over the wonderful relationships shared with their mothers, while others will grieve over broken bonds. Moms will feel loved and appreciated. Moms will feel neglected and rejected. Some mothers will be elated and in love as they celebrate the children God has entrusted to them, whether biological, step, fostered, or adopted. There will be mothers who willingly sacrifice for their children, while other moms leave their children to fend for themselves. Life doesn’t just stop because a national holiday pops up on the calendar. This year, I’m still missing my mother after her yearlong battle with Leukemia in 2014. I’m at peace as I grieve and celebrate the child I never got to hold, as my wonderful husband and I prepare to announce the name we should have chosen when we lost our first child to miscarriage in 1995. I’m praising God for blessing me with my loving, compassionate, hard-working son, Xavier, who is now almost twenty-two. And I’m grateful for the ways the Lord is now restoring a relationship with my stepson, who is loving and kind to me . . . though he prefers not to have his name mentioned in my writing. Happy and sad. Laughter and tears. Sobs of wailing and songs of worship. Crying out to God. Relying on God. Praying and believing God is with us. Even though Mother’s Day won’t be a happy day for everyone, it can be a hope-filled day for those who place their trust in the Lord. Elkana’s wife, Hannah, understood the desire to be a mother and the complexity of motherhood. Her husband loved her, cared for her, and provided for her. But he couldn’t heal he infertility (1 Samuel 1:1-5). Hannah was ostracized and endured great sorrow as she longed for a child (vv. 6-8). She didn’t mask her pain or approach the God’s throne of grace with a superficial thankfulness or praise. She acknowledged her suffering. She begged and bartered with the One who she knew could help her. She showed no concern over those who would witness her display of desperation (vv. 11-12). She poured out her soul to God and refused to pretend everything was “fine” (vv. 13-16). After Eli, the priest, encouraged her, Hannah moved forward in faith . . . “her face no longer downcast.” Her situation didn’t flip overnight, but her attitude certainly did an about-face (vv. 17-20). In God’s perfect timing, Hanna was blessed with the baby she prayed for and loved, cared for and dedicated to the LORD. She cared for Samuel and never gave up on him (vv. 21-28). If God’s people would have celebrated Mother’s Day back then, Hannah would have experienced joy and grief jumbled into a big lump of hope-filled heartache. Motherhood includes a mesh of emotions and moments worth celebrating and mourning. Hannah’s prayer reminds me how much more appropriate it feels to wish people a hope-filled Mother’s Day. She prepared a gift for the son she would embrace and release, celebrate and grieve, visit and leave . . . year after year after year (1 Samuel 2:18-20). With our eyes on the Lord and our hearts completely surrendered and secured by the surety of God’s proven faithfulness, we can move forward in faith when life can’t be explained by pat answers. “The LORD brings death and makes alive; He brings down to the grave and raises up.” (1 Samuel 2:6). Motherhood, a beautiful yet complicated and priceless gift, wraps us in an array of feelings we never realized we could experience. Thankfully, the Lord remains unchanging, sovereign in power and unlimited in love and grace. God was enough for Hannah. God is enough for us. When Mother’s Day or any day doesn’t feel very happy, we can rejoice in Christ’s sacrificial love for us. We can rest in the peace of His constant and almighty presence. We can thank the Lord, our Rock and our Redeemer, for empowering us to move forward in faith with hope-filled hearts today and every day. Lord, thanks for loving us, for knowing our names, and for caring about our deepest needs. Please bless the women who are longing for children, mourning children, and trusting You with their wandering children. Please bless the women who are at peace with Your decision for them to be childless, for women who have adopted or fostered children, and for those of us who are doing the best we can to love the children You’ve entrusted to us. Please be our peace, our strength, and our joy, as we lean into Your endless grace and spread Your truth and love with hope-filled hearts today and every day. In Jesus’s name, Amen. 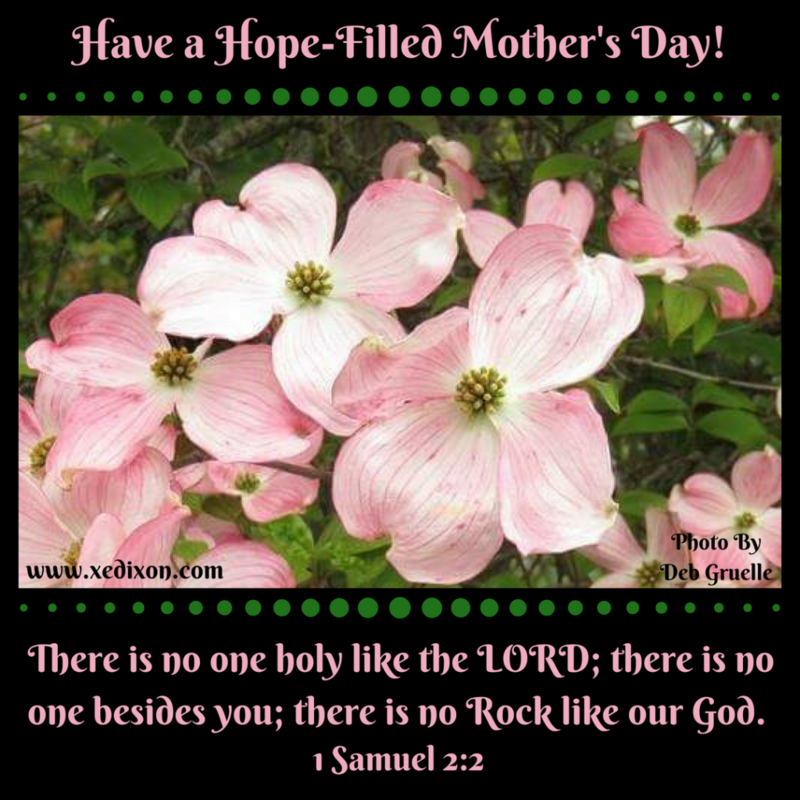 Please join me in sharing this post and praying for those who need to experience a Hope-Filled Mother’s Day. To God be the glory, the honor, and the praise! Blah-days sneak up on me once in a while. The hours pass normally, but time feels like it’s standing still. I feel God’s presence and know He’s working, but nothing else seems to be moving forward. Today, the morning and afternoon crawled by without a hitch. I wasn’t sad or discouraged. So, I couldn’t figure out what was wrong. Sure, I was tired and still battling chronic pain. But today was one of the better days I’ve had in a long time. Thank You, Lord. Sure, my husband and I are waiting on the Lord to show us the next step in several areas of our lives. But, we’re at peace and on the same page. Hallelujah! Today was a good day. Praise the Lord! Why couldn’t I focus? Why couldn’t I get motivated? Why couldn’t I write? We chatted for a bit longer before hanging up. His simple, but profound question lingered in my mind. Why didn’t I just rest? I didn’t have a deadline today. I’m ahead of the deadlines I do have. So, why didn’t I relax and enjoy the downtime? There’s absolutely nothing wrong with being still in God’s presence. Why did I feel like I had to do something to be productive? My blah-day gave me an opportunity to ask God to adjust my perspective and replenish my strength. Perseverance requires waiting, which is an active verb. Waiting on the Lord and walking with Him demands our attention in the present and is one of the most productive things we can do. We can waste valuable time and energy looking over our shoulders. But stressing over what might be catching up to us, might be ahead of us, or might be coming around the corner will only cause anxiety and extra worry-wrinkles. My husband likes to say that stress is self-inflicted. I used to think he was crazy when he said that, but now I’m rethinking my approach to stressful situations. Though sometimes we’ll want to believe we can’t help but worry, Scripture affirms God gives us power over our perspective. We can “let” our eyes stray to the left or right, or “look straight ahead” and focus on God instead of watching the clock tick-tick-tocking away. 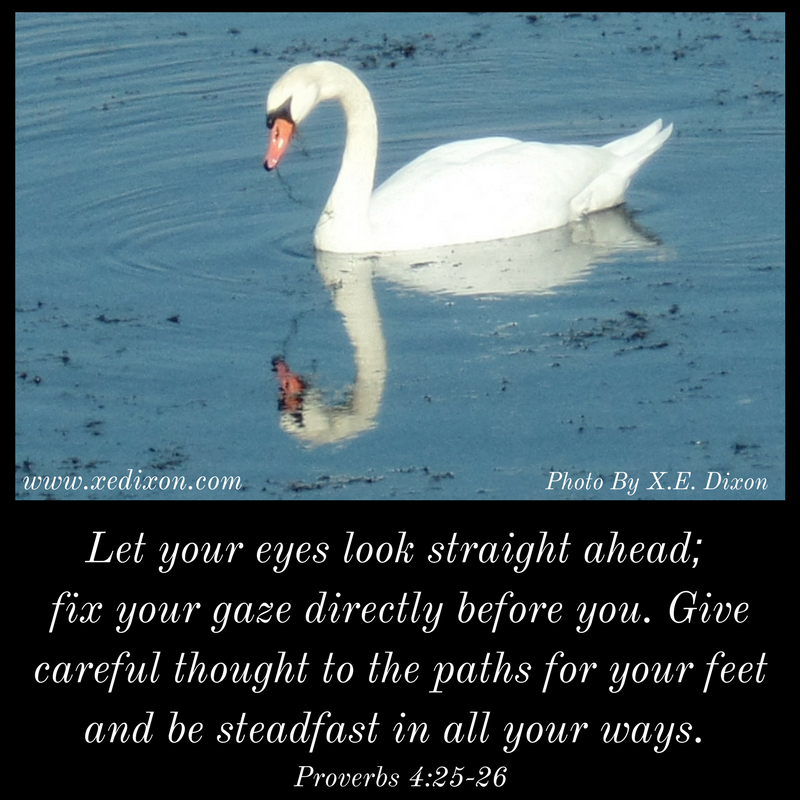 We can “fix” our gaze behind us and fuss over things we can’t change or rely on the Lord’s goodness to be reflected in the ways He’s ordained our steps. When we’re gazing “directly” at the Lord, we can follow Him in Spirit-empowered obedience. We can cleave to His unchanging truth, count on His constant and powerful presence, and avoid being ambushed by worry, paralyzed by fear, or distracted by selfish motivations. “Giving careful thought to the paths” God has set before us can prevent us from jumping ahead of Him. The Lord knows stillness is a vital part of energizing our faith for the long stretches that require endurance. Persevering when God hits the pause button in our lives involves patience and stillness, which can cause us to exert lots of energy and show great restraint. 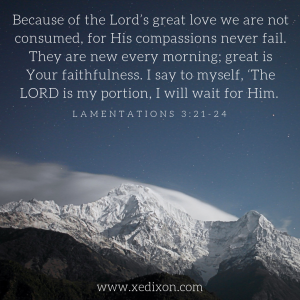 The next time a waiting season surprises us or drags on way longer than we feel necessary, we may tire and even honestly pour our frustrations out to the Lord. Rather than trying to avoid blah-days, long waits, and pit-stops, we can ask God to help us recognize the value in His deliberate delays. He’ll secure us in the still moments. After all, He’s already planned how to use these necessary times of preparation for His glory. Lord, thanks for assuring us that You are in control of the whole journey You’ve planned for us. Thanks for guiding us and reminding us that Your love is enough to carry us through life’s rough roads and tough time-outs. In Jesus’s name, Amen. How has God helped you deal with a waiting season that surprised you or dragged on way longer than you felt necessary? Why is it often hard to feel productive during times of stillness? What is the hardest part of persevering when God hits the pause button in your life? I’ve been praying over what to share on my blog for the last couple of weeks. When I planned on writing, the Lord led me to wait. I believe in obedience when it comes to following our all-mighty and all-knowing God. So, I waited. During my time of stillness, life around me sped up and threw a few unexpected punches. My last back procedure led to the expected four to six weeks of sporadic and high-level pain as the nerves die. While dealing with elevated pain levels and fatigue, my husband shared some news that left us facing a few challenging situations and seeking the Lord’s direction with a couple of big decisions. My check-up appointment with my doctor became a painful procedure that led to a glimmer of hope in my healing journey. My doctor thinks he finally found the root of the injury in my upper thoracic back, which could help him determine a treatment and healing instead of pain-management. Praise the Lord! God can heal me with a whisper or a thought. He can heal me through my doctors. He can also choose to empower me to continue trusting Him through this physically and emotionally draining affliction. Yet, by Thursday, I still couldn’t write this post. I opened my Bible and asked God what He wanted me to learn, or re-learn, so I could share. I leaned into His grace, totally at peace . . . and waited . . . until I landed in the Gospel of Mark. 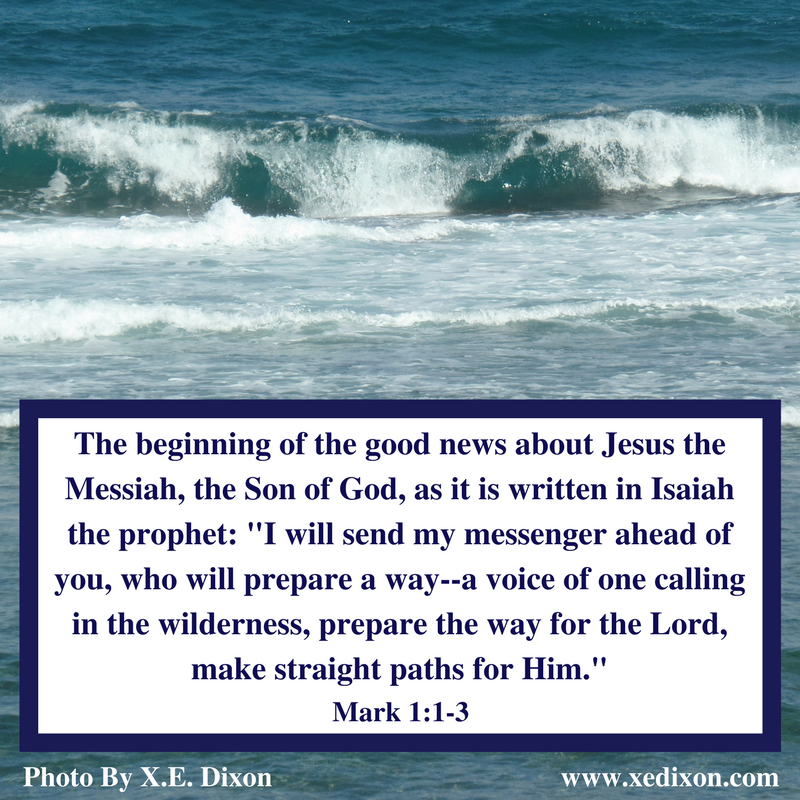 John the Baptist reminded me of my purpose as God’s beloved child. John the Baptist reminded me who was in charge. He “who is mightier” than I‒Jesus (Mark 1:7). He who baptized me with the Holy Spirit‒Jesus (v. 8). The Father is well pleased with the Son‒Jesus (v. 11). My Heavenly Father is also pleased with me, His beloved child. God loves us . . . completely. No matter how we struggle. No matter how often we fall short or fall flat on our faces. No matter how much we feel overwhelmed by our weaknesses, frustrations, discouragement, worries, and even doubts. No matter how long we’re battered by the winds of worry as we wait in the wilderness of what-else-can-go-wrong. God remains sovereign, loving constant and caring (vv. 12-13). He knows we’ll face temptations. He’s ready to meet all our needs. He’s not surprised by whatever the “wilderness” looks like in our personal lives. The Lord empowers us to navigate the obstacle courses riddled with pain, heartache, tough decisions, shaky ground, long lines, depleting resources, and foggy horizons. His ordained paths lead straight to the center of perfect will . . . according to His well-planned timing . . . not ours. We don’t have to fear God’s deliberate delays or detours. We can trust His compass, believe His complete goodness, rely on His proven faithfulness, and surrender to His Word. No matter when, where, or how we land on this path God has planned for us, we’ll be safe in the refuge of His life-restoring love. No matter what comes . . . Jesus is still enough. Father God, thanks for giving us confidence in Your abilities, Your trustworthiness, and Your never ending supply of love. Thanks for reminding us that we don’t need to know what’s ahead because we can trust You no matter what comes. In Jesus’s name, Amen.